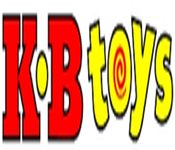 K·B Toys was a chain of retail toy stores in the United States. It was founded in 1922 by the Kaufman brothers. K·B operated 605 stores in 44 U.S. states. Following the company’s second bankruptcy in five years, the chain was liquidated beginning in December 2008. The sales were concluded on February 9, 2009.